A pair of ducks stop for a rest on the lawn of the Canadian pavilion at EPCOT. Someday, when I grow up, I want to live in that little cabin. Cute shot of the ducks, the cabin is pretty! I want to live there, too. The gardening is perfectly done! (And I love ducks). Nice duck shots, pretty photo. 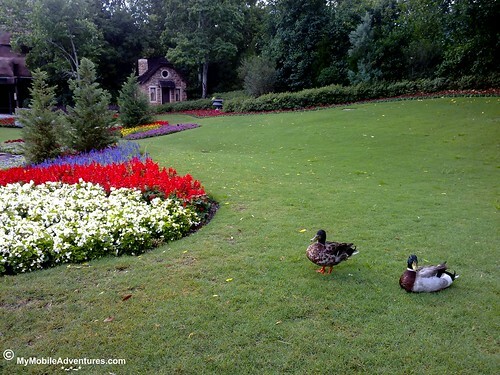 Ducks are the true rulers of the Earth and they live in all the nicest places.